Wisconsin makes the holidays bright for millions across the state with annual parades, light spectaculars, and lots of family-friendly fun at Christmastime. at "Caroling at the Cave". • Underground music ... at Christmas? 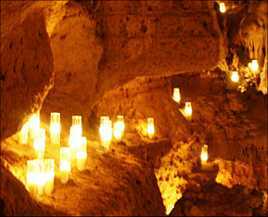 It happens every year at Cave of the Mounds near Madison where festive tea light candles and great acoustics set the scene for Caroling at the Cave. Come for the holiday concerts, stay for the sing-alongs. Cool. • With more than a thousand Christmas tree farms in Wisconsin, the state ranks No. 5 in the nation for Christmas tree production. This may also account for Wisconsin's No. 1 Christmastime tradition. • Milwaukee.com makes it a point every December 25th to update their local Christmas Day Chinese Restaurant Guide to let readers know which restaurants are open on Christmas day. Now who ordered the fried wontons? Milwaukee Holiday Lights Festival - Flipping the switch on the city's annual Christmas celebration with dancing lights, animated displays, and downtown store windows decorated for the holidays. Also check the complete schedule of family attractions, holiday performances and seasonal events going on around town. Milwaukee Marcus Center for the Performing Arts - The traditional home of holiday musical performances. Check out the calendar for what's on live on stage this year. WPS Garden of Lights - A winter wonderland awaits with illuminated trees, flowers and butterfly displays, including horse-drawn wagon rides, or a spin around the indoor garden railroad, at Green Bay Botanical Gardens. Rotary Lights - An annual La Crosse nightime spectacular with a magnificent display of more than a million lights around Riverside Park including a live Nativity, seasonal refreshments. Fond du Lac Home for the Holidays - Main Street is the scene of marching bands, music, floats and fun with a visit by Santa who does double-duty as master of ceremonies at the Christmas tree lighting. Christmas Tree Farms in Wisconsin - Where to find precut and choose-and-cut Christmas tree farms throughout the state, browseable by region including the Milwaukee, Madison, Fond du Lac and Green Bay areas with contact details, driving directions.